More than 1,000 pupils will be off school for the foreseeable future after a suspected arson attack destroyed almost half a secondary school. About 30 firefighters were at the Sidney Stringer School in Coventry, nearly a day after the fire started. 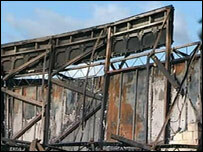 About 40% of the building is thought to have been wrecked in the fire, which started at 1530 BST on Tuesday. Initial findings led firefighters to believe the blaze was suspicious. Inquiries are continuing. Nearby residents were asked to keep their windows and doors closed overnight because of the threat of asbestos dust from the fire. Pupils were led out of the affected building as crews arrived. There were no reports of anyone being injured in the incident. The two-storey secondary school is in Cox Street, in the Hillfields area of Coventry, near the city centre. Council officials were meeting with head teacher Brian Worrall on Wednesday morning to discuss what would happen to pupils and their education. The city council's education spokesman John Blundell said one possibility was to transfer some lessons to the nearby City College. Mr Worrall said: "The priority is to find a solution for the pupils' education. "We are planning what we can for the children, especially those who have examinations coming up and we hope to have something in place by next week. "It's horrible what's happened. I've been trying not to look at it to be honest."